Is FertilAid right for me? Have people in my particular situation benefited from taking FertilAid? These are questions we receive on a daily basis and the answer is a complicated one. That’s because a broad spectrum of people take FertilAid: women with both irregular and regular cycles; men with a low sperm count; couples trying to conceive later in life, just to name a few. In short, all types of people, in all sorts of different situations, take FertilAid. Here is a short, but growing, list of trying-to-conceive conditions and/or issues experienced by trying-to-conceive couples. For each of these issues, we’ve included actual feedback from customers who’ve used FertilAid in an effort to help them achieve pregnancy or improve their reproductive health before conceiving a baby. And always, if you have questions, please call 1-800-367-2837 or live chat our above-and-beyond customer support representatives! It’s important to note that not all people who take FertilAid get pregnant. There are those who take FertilAid faithfully, exactly as directed, who do not achieve pregnancy. With so many variables to control for in the human body, there will always be many different outcomes. Some people may require prescription assistance in the form of fertility drugs, or even IVF, to help them conceive. Tens of thousands of people who have taken FertilAid have successfully achieved pregnancy – some in wonderfully, dramatic fashion after years of trying unsuccessfully. 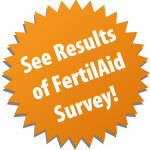 To be sure, the feedback we’ve received from FertilAid users over the years has been overwhelmingly positive. We provide many customer testimonials to help you decide. What Should I Take to Enhance Fertility if I Want Only Vitamins, Minerals, and Antioxidants? 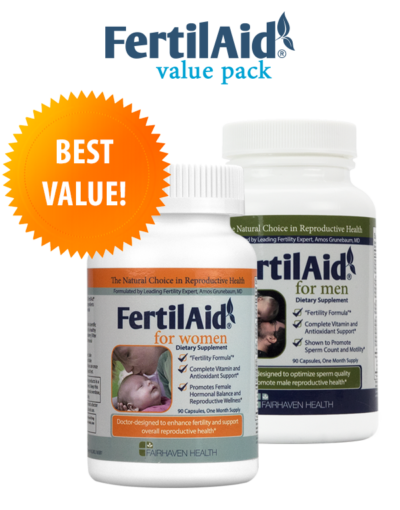 FertilAid, the top selling fertility supplement since 2003, is a comprehensive supplement that offers full prenatal vitamin support and key fertility enhancing ingredients, including several herbs. Doctors and fertility specialists often like to control the number of variables involved while treating a patient, so they will sometimes advise their patients, especially females, to avoid herbs. Herbs for fertility do not contain hormones but do have the ability to affect key hormones. This interaction with hormones consequently has the potential to affect how fertility medications work in your body. If your doctor is prescribing fertility medications, he or she may advise you to stop taking any supplement containing herbs. PeaPod Prenatal Vitamin plus OvaBoost for Women – OvaBoost is a specialty fertility supplement that targets egg health. It includes a trio of ingredients – myo-inositol, folate (as methylfolate), and melatonin – that has been studied for its benefit in supporting egg quality and ovarian function. OvaBoost also contains Vitamin E, CoQ10, and alpha lipoic acid, key antioxidant nutrients that protect eggs from the damaging impact of oxidative stress. Unlike FertilAid for Women, OvaBoost does not contain full prenatal vitamin support, so we recommend combining OvaBoost with PeaPod Prenatal to be sure you get the recommended amount of iron and other essential nutrients for preconception and pregnancy wellness. This combination can be used by women with regular or irregular cycles. 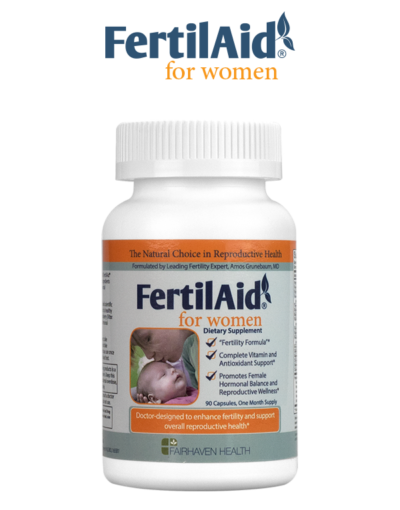 FH PRO for Women – Like FertilAid for Women, FH PRO for Women is a comprehensive fertility supplement, offering full preconception vitamin support, including iron and folate (as methylfolate), along with key fertility enhancing nutrients. aimed at preventing oxidative stress, FH PRO for Women includes an array of antioxidant nutrients, including CoQ10, Vitamin E, and alpha lipoic acid, to protect egg cells from the damaging effects of age and environmental toxins. FH PRO also includes myo-inositol and d-chiro inositol to promote hormone balance, insulin sensitivity, and ovarian function. FH PRO for Women can be used by women with regular or irregular cycles. What Should I Take if I Am Planning to Freeze My Eggs? Women who are not yet ready for kids are increasingly interested in freezing eggs. Unlike previous generations, women can rest easier knowing that they are empowered to plan for their family without the loud ticking sounds of the biological clock. Freezing eggs is an investment of both time and money (unless your company will pay). Needless to say, the better the quality of the egg before freezing, the better the chance of positive pregnancy and healthy baby outcomes. We recommend taking our clinical grade FH PRO for Women, a comprehensive formula including vitamins, minerals, and antioxidants that contains no fertility herbs. FH-PRO for Women is an evidence-based, doctor-formulated dietary supplement designed to promote egg quality, ovarian function, and overall female fertility. The following are actual reviews submitted to us by couples who’ve achieved pregnancy with FertilAid after trying to conceive for an extended period of time. 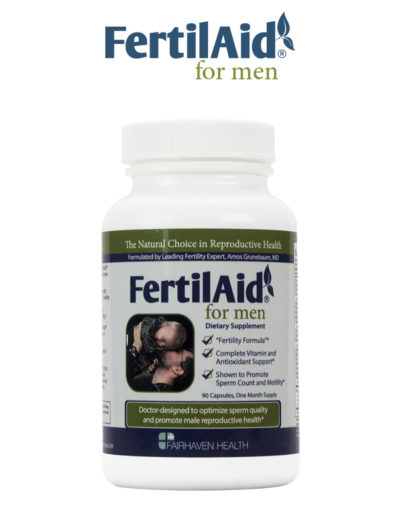 Click to read the newest FertilAid for Women reviews or FertilAid for Men reviews.